I feel a lyrical wax coming on. 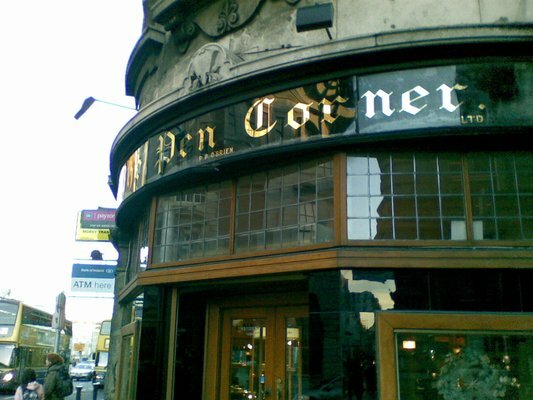 I’ve written about Camden Street before. I like it. Sometimes better than others. The best times were in the mid 1980s. But it’s still got character and variety and an extraordinary range of shops and services. 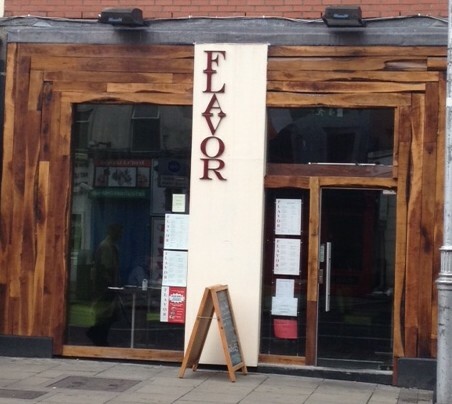 Flavor (yes, no u) is next to the Bank of Ireland, on the stretch from Pleasants Street to Camden Row or, in pub terms, from Devitt’s (which I will always think of as the Cusack Stand) and Ryan’s. It’s where Yum Yum used to be. My attention was drawn to it the other day by a curious combination of a board outside advertising Tuna Melt for a fiver and the sight of four young woman at the window table tucking into enormous cooked breakfasts. Who could resist? I have to confess that I wasn’t sure what a Tuna Melt was. I asked Ruth (who works with me and knows many useful things) and she told me it was a combination of tuna fish and melted cheese, most probably contained within some sort of bread or toast. I’ve had that before and I remember not being sure about it. Inside, it’s quite green and deceptively spacious, seating maybe 36. 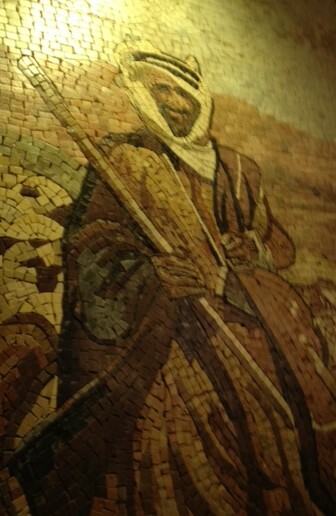 It has some blank walls that cry out for something on them to soften the look a bit. Sarah, who was welcoming, friendly (with all the customers), attentive, very helpful and very informative, told me that Flavor had been open for about two months. It’s open seven days a week, from breakfast time (this is a fudge – I can’t remember what time she said it opens) until about 4pm. She told me about the breakfast menu (several breakfast offerings cost a fiver or less) and the daily specials (costing a tenner for A LOT of food and a beverage). 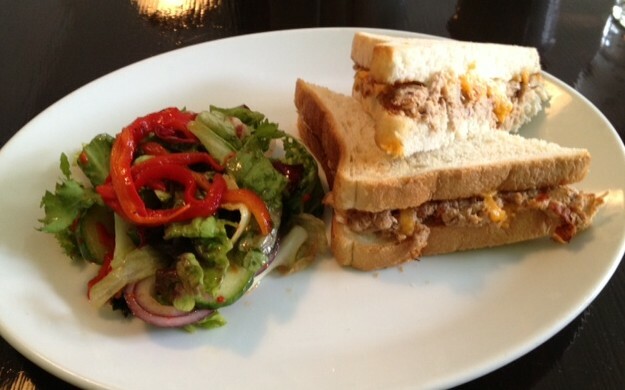 She also confirmed the composition of the Tuna Melt, more of which below. Every café/small restaurant should have a Sarah. Again, my poor photography on a phone camera does not do this justice. That’s a big plate and quite a substantial side salad. As Sarah explained it, Flavor’s Tuna Melt isn’t just tuna and cheese. It also contains finely chopped peppers and sun-dried tomatoes. The cheese was tangy (finely grated and lightly melted) and the tuna plentiful. The toast (you can have a choice of brown or white: I chose white) was made with fresh bread and was lightly toasted so that it was exquisitely crunchy on the outside and soft inside. I can’t believe that I’m writing like this about a sandwich but, actually, this was GORGEOUS. The side salad was pretty good too. Fresh leaves, some red onion (could have been sliced a little thinner) and strips of roasted pepper. Tasty and filling. €4.95. Oh yeah. I felt comfortable in Flavor and, encouraged by Sarah’s description of a ‘healthy’ muffin, I broke my own rule and ordered one, with an Americano. The coffee was good and the muffin delicious (cranberry and orange with lots of seeds to justify the ‘healthy’ description). Coffee and muffin cost just €2.95. Stuffed, I paid, said goodbye to Sarah and left. 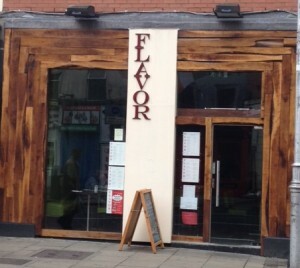 Flavor is one of those places I’d love to see do well. It’s unpretentious, serves good value decent filling food which is nicely presented, and has welcoming, friendly staff. It could do with an internet presence just so as people know it exists. 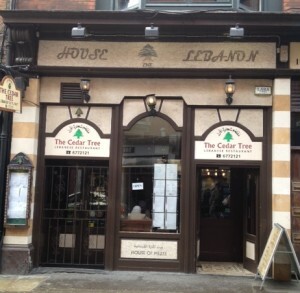 If you’re in the Camden Street/ Wexford Street area, please give it a go and see what you think. I don’t want to be unfair here to The Cedar Tree in St Andrew’s Street, Dublin because first, it’s a nice looking place (inside) and second, it’s got overwhelmingly positive reviews for its food on Tripadvisor and other sites. My lunch here today, however, was disappointing. The wrap choice is Shawarma Beef, Shawarma Chicken, Falafel and Kafta. I’d had enough meat this week so I decided before I went in to have the Falafel one. … on the walls and mosaic inlaid tables contribute to a pleasant ambience. I got there at just after 1.30pm and the place was pretty full. Interestingly (to me, anyway) there were more women wearing hijabs and niqabs than I have ever seen in a restaurant before. I was shown to a table and handed a laminated menu. On the menu the price shown for the wraps was €5.50. I asked about this, and was assured that they were actually €4.95. I ordered and waited. 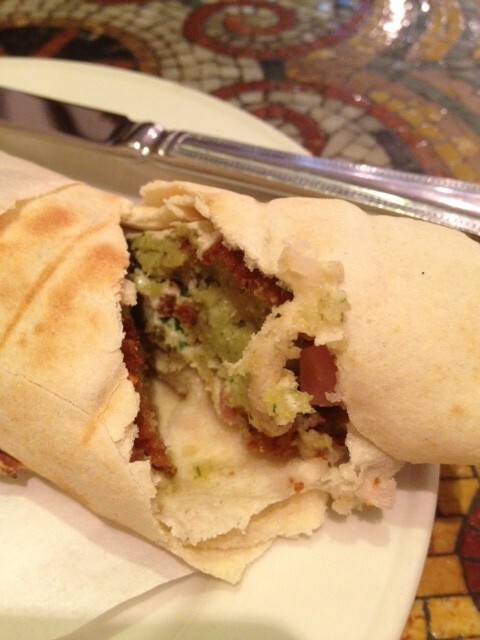 On the menu, the Falafel Wrap was described as including ‘tomato, radishes, pickles, parsley and tahini sauce’. Sounded good. I took it out of its wrapper and broke it open to look inside. It was unusual in that the outside was crisp, as if it had been toasted after having been wrapped. This gave it a crunchy texture which was quite pleasant. The falafel wraps I’ve had in the past have comprised falafels, the quite dense texture of which has been contrasted with the freshness of its accompaniments (usually vegetables of some sort) and the moist tanginess of a sauce. The overall effect has been one of reasonably balanced flavours and a variety of textures. This wrap had neither, sad to say. It was stodgy. There’s no other word for it. 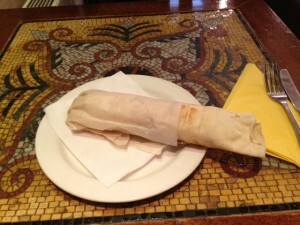 I came across a faint taste of tahini in the first bite but didn’t taste it in the remainder of the wrap. I didn’t find much tomato and the tomato I did find didn’t taste of tomato. There were some pink slivers of something in it (radishes? pickles?) but they didn’t really taste of much either and they had certainly lost any crunchy sharpness that they might previously have had. Near the middle, I think I saw some parsley but I didn’t taste it. It was filling. But it was also stodgy. And disappointing. 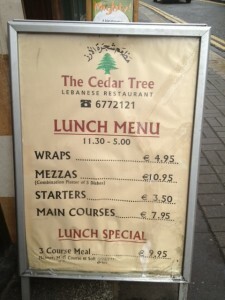 But as I said at the start, I don’t want to be unfair to The Cedar Tree because of this one wrap. Maybe falafel wraps aren’t really their forte. 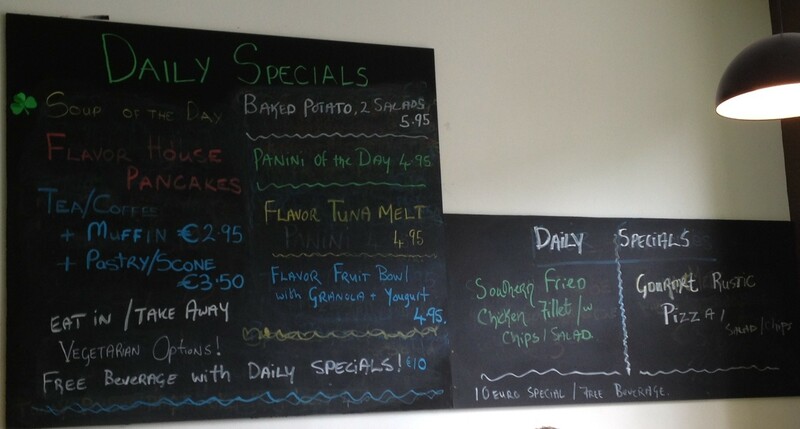 The other items on the lunch menu look pretty good value and the place was pretty busy with (mainly) groups of diners all chatting and munching away. In other words, don’t write it off just because of my impression of the wrap.